Oh, and one more thing - when you order the Speed Passion motor, best order a sensor cable with it. The motor comes with a short sensor cable suitable for installation in a touring car where the ESC is typically close to the motor, but you will want a longer one to reach the rear-mounted motor on the DT-03. I found a 150mm cable reached nicely, with enough slack to avoid stressing the cable, but not so much that it flapped around and got in the way. ahhh? thank you... sound advice - will do. These are a great chassis and are happy handling a fair amount of power only thing I'd say is to second the Steel pinion (19t) and be prepared for the front to lift off the ground if you give full berries on a grippy surface...! I now have the brushless speedpassion MMM 13.T today with all the bits and 19t pinion. going to run it on nimh to begin with and then Lipo v soon. Yep heard about the lifting under hard acceleration - maybe going to get some sticky wheel weights to weigh it down. What lipo battery do you use Olly? ...and what tyres do you have at the front there? Shumachers? yellow? Wotcha @friskyjim. Ta for the compliments, they are indeed schumachers front and rear. Not quite the right size for the rims - the front wheels could do with being a touch wider but work brilliantly on cut grass and dirt all the same. Lipo is a round nVision 3700 but you can fit a square hardcase 5000mah lipo in there quite happily. The extra weight helps to. I use Core, nVision and Peak Powerplant batteries which all fit no problems. You'll have to let us know the outcome of the race! Ha ha, will do, think it will start off an arms race with his mates dad (who's a good bloke - one of the lads) so will be fun, my sons friend didn't want my son to get a grasshopper so will be pleased when he sees my son hasn't 'pirated' off him (which is never cool - no one likes a copycat) so hopefully his mate will take a beating (in a car race) gracefully. 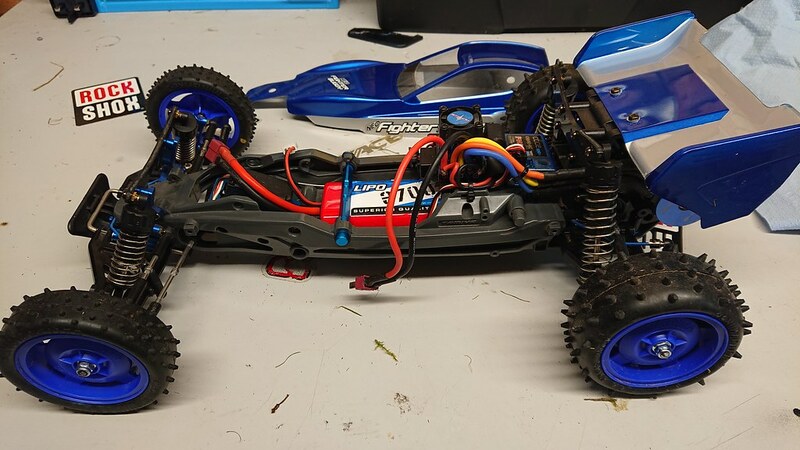 Thanks for the lipo and tyres advice) advice - will start off on nimhs but when his mate upgrades his car (or buys a new one) we'll upgrade the batteries to lipo and get a charger. Thanks Turnip & Otty, it looks way better in the flesh, the chrome reacts to whatever is reflecting onto it, the chrome colour is iridescant and is constantly manipulated by the light and dark of its surroundings, .... I suppose that's the point of chrome (The body and the wheels - the rear spoiler is chrome too) So well please. Bit of a shelf beauty queen. The picture I've taken of it is with a crappy old phone, but looks so nice - hope my boy doesn't wreck it too soon. 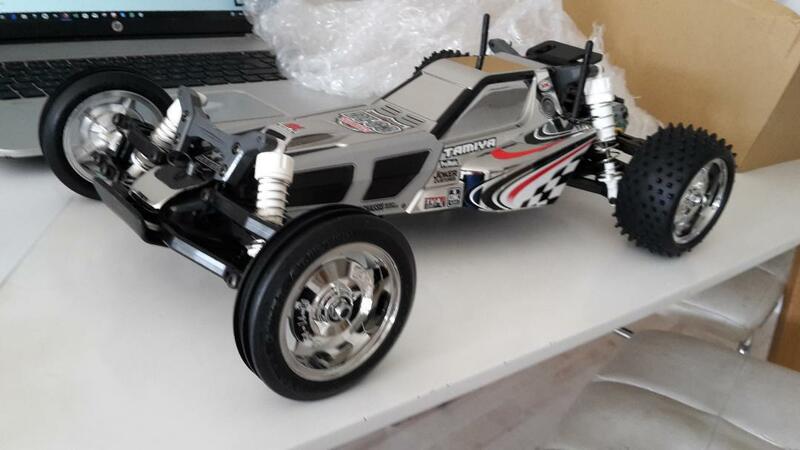 Turnip; just a quick question hope you don't mind - I got the speedpassion otday - but no wires connectted to it, do I need to solder (as I have never soldered before and don't have the kit) or can I just connect straight off the wires leading from the tamiya TBLE-02 ESC ? I suppose I could google it bt just wanted to ask you guys first? You (or someone you nominate for the task) need to solder the connectors that came with the motor onto the wires that came with the ESC. Then you can plug the ESC into the motor. Don't worry - it is a very easy job thanks to the shape of the connectors that hold the wires in place for you. OK will do thanks - also got the 150mm sensored wire too that you kindly mentioned - cheers for all your help Turnip and the rest of the fellas (probably mostly fellas I think) on the forum. Following the manual's ESC orientation and cable routing means that the cables won't reach the motor if soldering the connectors straight to the ends of the ESC wires. However if you orient the ESC and route the cables as below, everything fits nicely. thanks chaps - will look into that and get back to you. 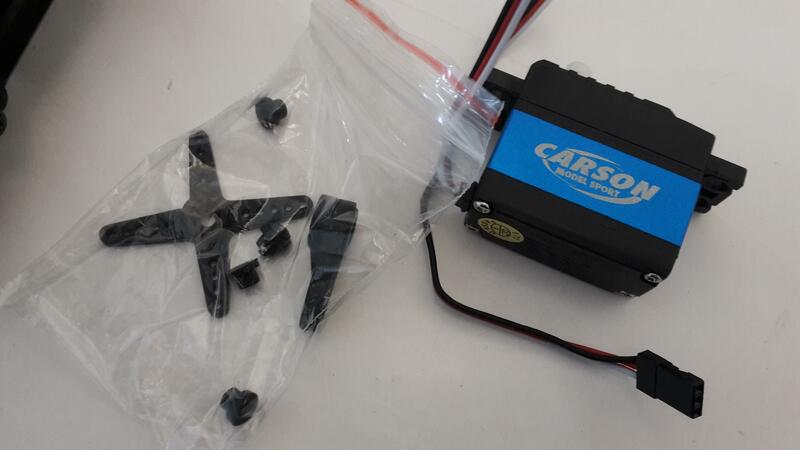 the sterring servo doesn't work so am putting in the carson reflex racing servo cs3 that came with the transmitter, took out the old non-working steering servo and now can't put back in the new one? Is there any instructions you chaps could guide me to fix this back up? cant even get the steering rod connector screw to screw back in? help most appreciated? Look for DT-03 manual here. Much easier to look at pics than try to explain! All measurements and screw sizes are indicated. ahhhhh - thick as frozen pig muck I am! In photo 2 I've connrcted the new carson servo to the servo mount and when trying to connect to the white (P tamiya) parts it won't connect? In pic 2 with the carson you can see the small bag of parts it came with - I am completely lost here - can anyone assist? 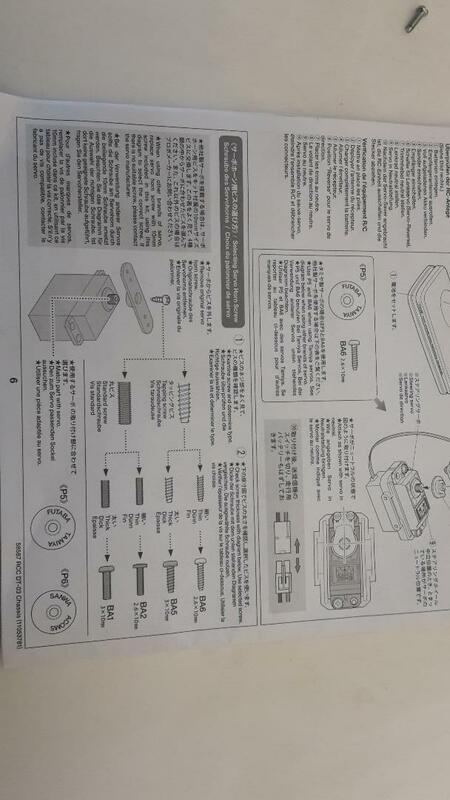 pic 3: instruction in manual. There is nothing in the manual about this - however, there is a different section explaining if using a different servo but not specifically the parts I have in correspondence to what tamiya are trying to explain? Yep - I'm useless, any adice re fitting this? thanks guys. 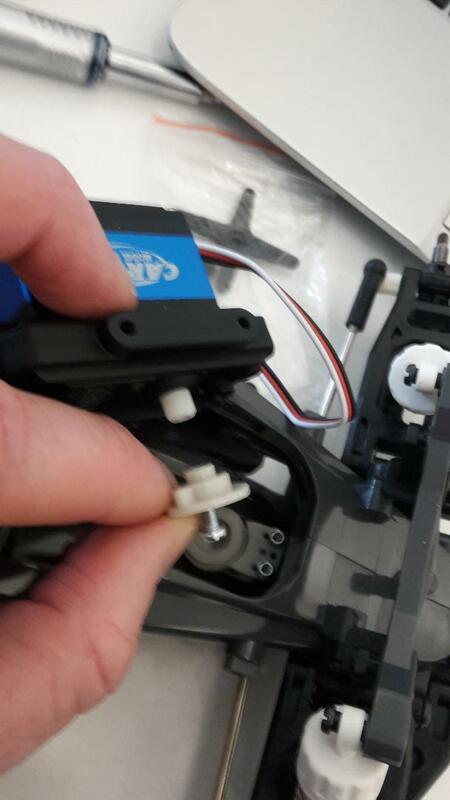 In your pic the screw is going into the hole that fits over your servo gear. Take the screw out, flip the piece over and it will fit together with the parts you have connected to the steering rods. 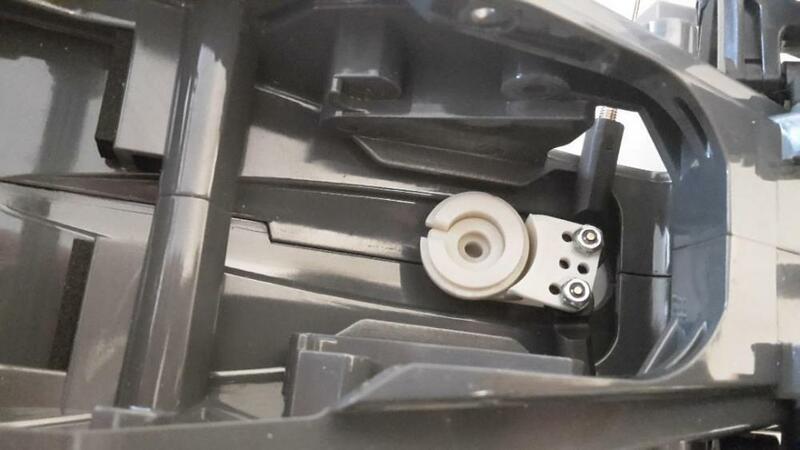 You should disconnect the steering rods, and put the servo saver together outside of the car before you connect to the steering rods. It may also be easier to (carefully) un-pop the steering rods off the steering knuckles and then remove the servo saver and steering rods in one piece. You can then follow from Step 5 in the manual, oh and make sure the servo is centered. Hope servo still centrered? I have been messing about with it so much - is there an easy way to check? You can pretty much ignore the bag of bits that cane with the servo from my experience. With the Tamiya kits I’ve built I’ve only needed the parts that came with the kit and not what cane with the servo. Connect both the servo and speedo to Channel 1 and 2 respectfully on the receiver. Connect battery to speedo (no need to connect to motor) . Turn on transmitter then turn on speedo. If all wired up correctly then the servo should center, double check all trims are also centered then turn off the speedo followed by the transmitter. Heh heh - like it Otty - yep hope so - just building my (very low) mental energy back up - for another stab at this a little later (I've fixed probs with gearboxes and motors etc but never steering servos) it's really done my nut in! I've been a proper mardy-a--- about it all - hopefully will be able to (pop the rods out cleanly) and do the servo centering and go form there. Thanks to all of you who have helped a *******less crybaby - you're all proper bo.